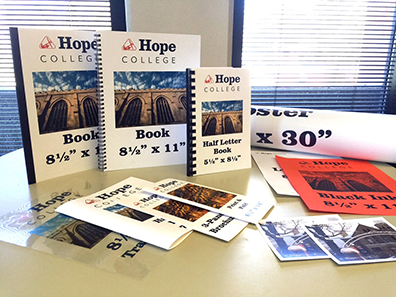 Campus Print Services is committed to providing extraordinary, efficient, and cost effective printing services that help contribute to the success of the Hope College Community. Single and Double-Sided Printing available on a variety of paper stocks, colors and sizes. Copying available in black ink as well as color. Posters can be printed in black and white or in color on either heavy-weight high-gloss or on matte paper (recommended for laminating.) Posters should be ordered for sizes that exceed 11”x17”. Envelope Printing can be done in black and white or color. We offer blank #10 envelopes as well as #10 envelopes with the Hope College logo and return address. You may also supply your own envelopes in different styles or sizes. Please ensure that your file is the same size as the envelope itself. Cutting and Folding Services are offered free of charge. Cuts can be made as small as 2”x3”. Folding can be done on single sheet, regular weight paper in the following styles: half (booklet), brochure tri-fold, z-fold and gate. Laminating is offered for copies and posters sized up to 24” wide. Binding Services include single or double stapling, saddle stitching of booklets, tape binding, plastic comb binding and wire combing. All bindings are available in black. Specialty colors are available if orders are placed one week in advance. Transparencies can be ordered in black and white or in color. Scanning converts hard copy materials into an electronic format (jpeg, pdf, etc.). This service is available for large format print materials up to 11”x17”. The scanned files will be sent to one of our workstations and from there can be forwarded to your email or saved to thumb drive.